Two-thirds of Americans say it is generally easier for men to get elected to high political offices (67%); just 5% say it is easier for women, and 27% say there is not much difference. Views are nearly identical when it comes to top executive positions in business. 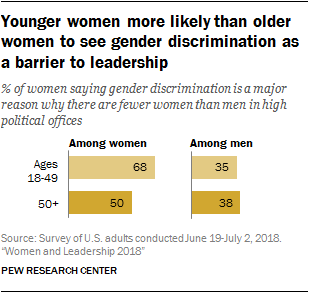 Majorities of both men and women say it is easier for men to get top leadership positions in politics and business, but this view is particularly prevalent among women. 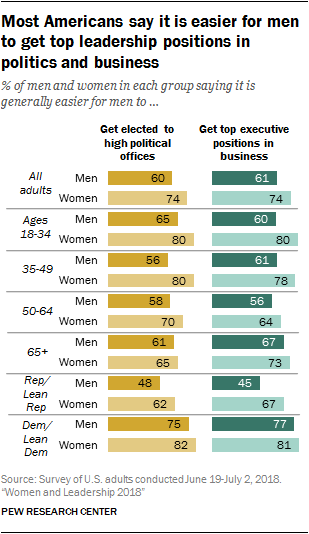 About three-quarters of women say it is easier for men to get elected to high political offices and to get top executive positions in business (74% each), compared with about six-in-ten men who say the same. Relatively few men or women say it is easier for women to get these positions. Americans see similar obstacles for women who are seeking top leadership positions in politics and in the corporate world. About six-in-ten say a major reason why women are underrepresented in high political offices and top executive positions in business is that women have to do more to prove themselves than men. About half say gender discrimination is a major barrier for women in each of these realms. Substantial shares also say that many businesses are not ready to hire women for top executive positions (47%) and that many Americans are not ready to elect women to higher offices (45%). Perceptions of what contributes to the underrepresentation of women in political and business leadership positions vary widely across genders. At least seven-in-ten women, but closer to half of men, cite women having to do more to prove themselves as a major reason why there are fewer women than men in top business and political positions. A majority of women also point to gender discrimination and voters not being ready to elect women as major barriers for women in politics. In contrast, roughly one-third of men see each of these as major reasons why there aren’t more women in higher office. 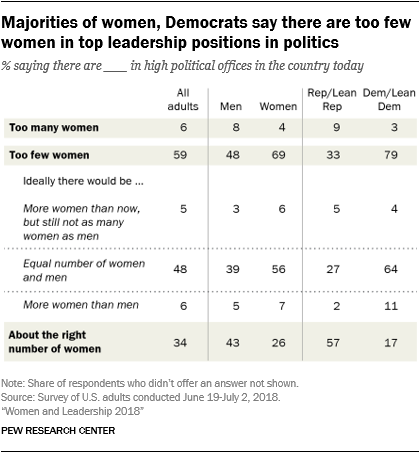 In turn, men (31%) are more likely than women (23%) to say women simply aren’t as interested in holding top leadership positions in politics. 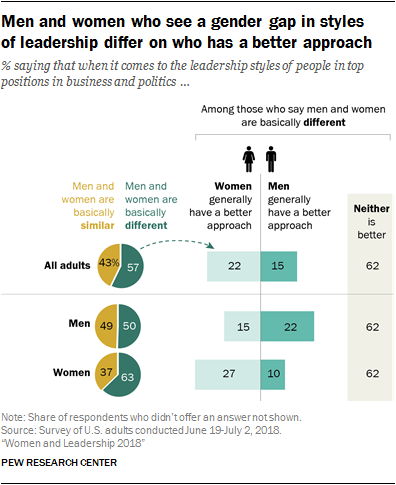 A majority of Americans (57%) think men and women in top positions in business and politics are basically different when it comes to their leadership styles; 43% say they are basically the same. Among those who see a difference between men and women in this regard, most (62%) don’t think either gender is better; 22% say women have a better approach and 15% say men do. Again, views on this differ significantly by gender. 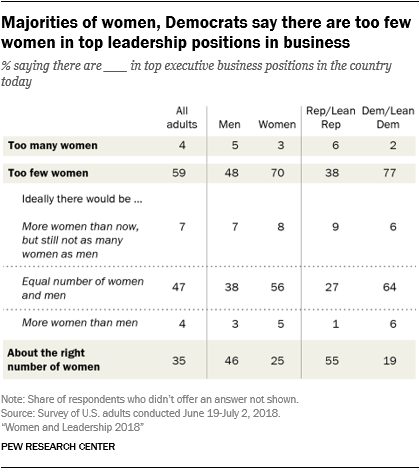 Women are more likely than men to see a gender difference in leadership styles (63% vs. 50%). Among those who see a difference, about one-in-four women (27%) say that women have a better approach, while 10% say men are better. Men are more evenly divided on this: 22% say men have a better approach, 15% say women do. Among Republicans, men and women have substantially different views on this issue. 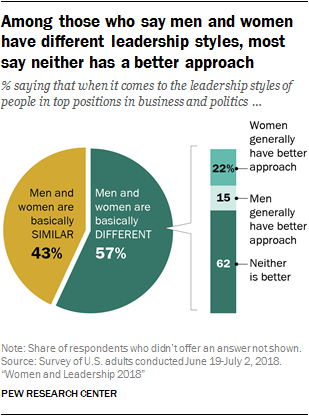 Roughly a third of Republican men (32%) who see a gender gap in leadership styles say men have the better approach, while only 6% say women have a better approach. Republican women are more evenly split: Among those who say men and women are basically different, 15% say women have a better approach and 18% say men do. Majorities of Americans see little difference between men and women on a range of specific qualities and competencies that may be required for effective leadership. Among those who do see a difference, however, women are perceived to be stronger in most areas in both politics and business. Being compassionate and empathetic and being able to work out compromises are prominent examples of this. For their part, men are seen as having a relative advantage in being willing to take risks and negotiating profitable deals. 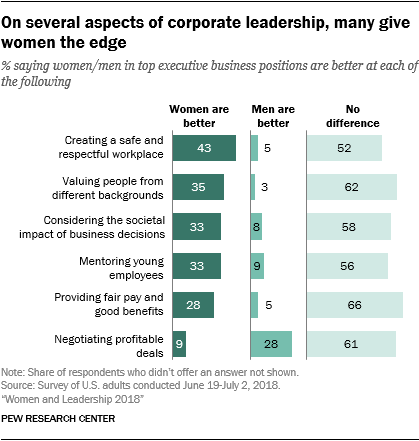 Among the traits Americans see as most essential to being a good business leader – creating a safe and respectful workplace and being honest and ethical – higher shares point to women as having the upper hand rather than men. Still, many say there is no difference between men and women in both cases. Women are more likely than men to say female leaders outperform men on several leadership dimensions. For example, 71% of women say that women in political leadership are more compassionate and empathetic than men, while 50% of men say this is the case. Similarly, women are more likely than men to say that women in high political offices are better at maintaining a tone of civility and respect (41% vs 27%). For their part, men are more likely than women to say gender doesn’t make any difference for these and several other aspects of leadership. When it comes to business, there are wide gender gaps on two items that relate directly to workplace culture. Women are significantly more likely than men to say that female business leaders are better than their male counterparts at creating a safe and respectful workplace and providing mentorship to young employees. Americans see only modest differences when asked about men’s and women’s abilities to run different types of companies. Still, many in the public associate some industries more with one gender than the other. Roughly three-in-ten adults (31%) say a woman would do a better job running a major retail chain. Only 6% say a man would do a better job at this. And the public is about twice as likely to say a woman would do a better job running a major hospital (19%) than to say the same about a man (8%). Men have a relative advantage when it comes to views of running a professional sports team – 45% say a man would do a better job at this, while 2% say a woman would be better. The public doesn’t see either gender as having a significant advantage over the other in handling several key policy issues. On immigration, gun policy, the economy and the budget deficit, majorities of Americans say there’s no difference between male and female political leaders in their abilities. And among those who do see a difference between men and women in these areas, opinions are fairly evenly divided. There are two exceptions, however. By a margin of 42% to 4%, the public says women in politics do a better job handling social issues such as education and health care. The opposite pattern holds for dealing with national security and defense – 35% say men are better on these issues, while 6% point to women. When asked whether certain personal traits or characteristics would mostly help or mostly hurt men and women seeking to succeed in business or in politics, about seven-in-ten adults say being assertive and ambitious would mostly help a man’s chances in both realms. Closer to half see these traits as helpful to women who are trying to get to the top. In fact, about a quarter say being assertive and ambitious mostly hurts a woman’s chances of getting ahead in politics and business. An attribute that’s viewed as more helpful to women than to men is being physically attractive. Six-in-ten adults say this helps women get ahead in politics, and an even higher share say it helps women succeed in business. Fewer say being attractive is helpful to men. Showing emotions is seen, on balance, as being more harmful than helpful to both men and women. Still, more say this hurts female leaders than male leaders. About half (52%) say showing emotions hurts women in politics, 39% say this about men. Smaller shares say this helps men (24%) and women (17%) in getting elected to higher office. The patterns are similar for business leaders.